We are having crazy weather here - extremely hot, interspersed with violent storms, complete with torrential rain, hailstones the size of eggs and magnificent lightning displays. A lot of places flooded and were really damaged. The weather will be staying with us over the next days....It is the hottest May since temperatures were recorded. My apartment also feels like a hot-house, most of the places here do not have air-conditioning. I received this gorgeous book in the post from Susan Swiderski. She asked some time back if she could use one of my sunrise photos for the cover, and here it is. I was honoured to be asked, and am proud to have my own, autographed copy, and am looking forward to reading it. Thanks a lot, Susan! The weather is very strange in all the Europe as i can see from my blogging friends! Even in the Netherlands it’s hot and with storms and rain! Wow! All your artworks are gorgeous creations! Love especially the African lady piece! Congratulations for your picture on the published book! Wonderful pictures from the castle and the beautiful surrounding! Thank you for sharing! Have a fabulous day! Hugs! I especially love your African beauty, and of course, the Gibson Girl is a favorite, too. You create beautiful photos, so it's no surprise one of your sunrises appeared on the cover of that book. It's gorgeous. The photos from Burg Brüggen are fabulous and that castle is amazing. I was also quite impressed that you brought back your version of Van Gogh's Mother. It's a lovely painting and I am most impressed with it. Thanks for sharing it for this month's second look on the 2nd. Awesome artworks Valerie - loved them all. Our weather is pretty much like yours except maybe for the size of that hail - stay in doors when that happens. Hope it cools down and gets back to being warm and pleasant soon. That book cover looks great! Wow! Your stunning photo as a book cover!!! Love it!!! Your portrait painting is so beautiful! I love your art Valerie, it is amazing! An outstanding post and my comment is filled with exclamation marks!!! Sunrise at your house is so gorgeous and looks spectacular as a backdrop for your artwork. You have such a way with color. 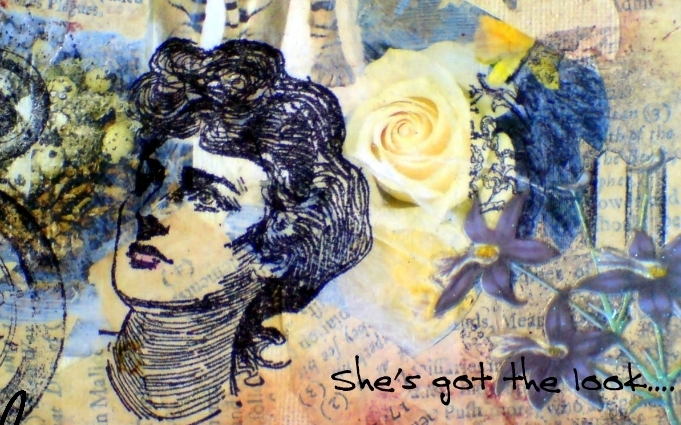 The Gibson girl makes me thing of a wedding and the other looks like undersea to me. The background color makes Mutti Van Gogh's eye color pop. The castle/hotel would make a lovely wedding venue for your Gibson girl. Hope you get some relief from the hot and stormy weather. Stay safe. Beautiful pieces for PPF and the other challenges, stay cool! Congrats on the book cover, your photo is beautiful as always. Enjoyed your photos of the old castle today. So much 'good stuff' today. I recognized the background in the first! Beautiful. The book cover turned out beautifully. Both you and Susan did a wonderful job. Wow. I didn't realize just how bad your weather was. Hope your day is filled with good weather and good health. So many amazing pieces of art you have shared. I love them all but my favorite is your Gibson girl postcard and your Van Gogh: Mutter! And some beautiful photos, Valerie. Lauter richtig schöne Werke hast du da kreiert und das Foto fürs Cover ist traumhaft schön. Da konnte die Autorin sich aber auch freuen das von dir zu bekommen. Deine Fotos von Brüggen sind auch wieder einmalig gut, wie immer, ein Genuß. Wow Valerie. I am in love with all your stunning and beautiful art pages. The hand cut stamp looks amazing with one of your own sunrise photos. You must be thrilled at seeing one of your fabulous photos on a book cover. It would really tempt me to purchase the book. Wonderful photos as well. I hope you get cooler weather and less storms, although once they leave mainland Europe they seem to find their way to the UK. Oh Valery, I am so happy for you. Your photo is on a book cover! Congratulations, my friend. You know that I always admire your beautiful photos!!!!!! And, of course, I always admire your stamps. Your African lady is gorgeous!!!!!! And, I LLLLLLLLLLLLOVE your painting of Van Gogh!!!!!!! Kisses, my friend. 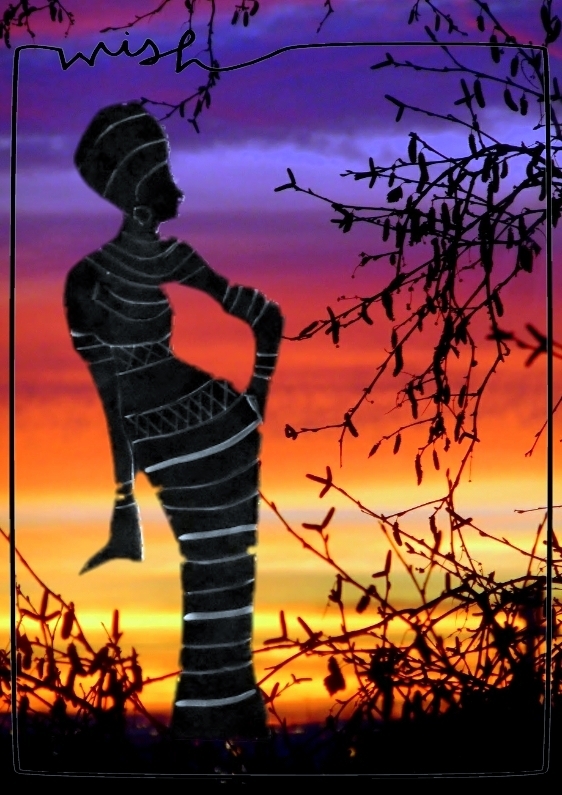 Hi Valerie, I think your African lady is perfect against your sunset image. They fit so well. What absolutely crazy weather you're having! Mother Nature can definitely throw everything at us sometimes can't she!! Congratulations on Susan's use of your beautiful photograph on her bookcover. It's great. Your Postcard is lovely as is your version of Van Gogh's Mother. The pastel and paint combination gives a lovely olde worlde feel. The artisan market would be fun to attend, especially in those beautiful grounds. A fabulous post Valerie and so much to see and enjoy. 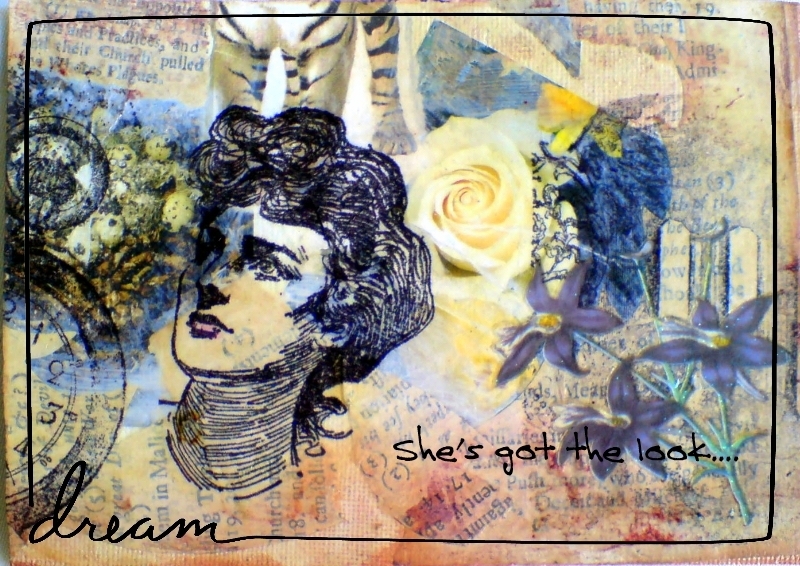 Love the stamp set in one of your wonderful photographs. No wonder one of them was chosen as a book cover.. imagine how many people will see it and enjoy it now..
Great choice for second on the second as well. Loving all your reworks Valerie and your carved lady looks amazing against that background. I adore taking a walk around your blog. Love it all. Especially the silhouette. WOW! Your post is packed full of goodies today, isn't it? I already loved your African lady stamp, but set against that sunrise, it looks especially stunning. The colors are spectacular. Your other artwork is beautiful, too, but I reeeeeally like your version of Van Gogh's mutter. You are one talented lady. Have a fabulous weekend. Try to stay cool! love your African beauty art the best today although it's all just wonderful! Beautiful photos of the castle and surroundings. And congrats on having one of your gorgeous photos on the book cover! Happy PPF and wishing you better weather days. Lovely art creations ~ all them and delightful photos of the castle and landscape! I just adore your version of Van Goh's "Mutter." How creative you are--and your photography is beautiful, too. Thanks for sharing those lovely photos from you walk, hope your weather improves and settles. 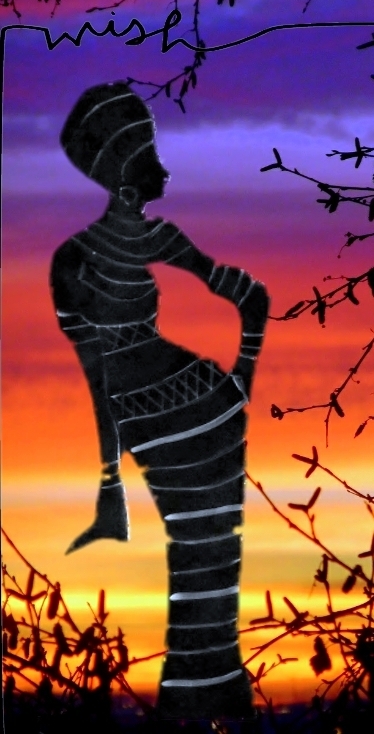 that sunrise background for your African lady is fabulous! And I like your version of Van Gogh's mother. You must be so thrilled to see your beautiful picture on the cover of a book! How exciting! Happy PPF! Wow, there is so much beauty in your post. I love the stamp art and your photograph looks amazing as cover art. The look is beautiful as are your photographs. I hope the weather gets more reasonable soon. Luv that first one, the sassy lady. All the others are interesting as well. And always your photos give me such a lift. Happy you shared. Thanks for dropping by my blog today. Great post as usual, Valerie. Loved Van Gogh's mum! We are having similar weather and wonderful sunsets too! the used to be an RAF Station at Bruggen. So many amazing works in one post! Your African sunset is pure magic, and I love your version of Van Gogh's Mother. I don't remember if I saw that before, but it's a brilliant portrait. Lovely to share your trip too, though I wish we weren't sharing the thunderstorms. It's settled down a bit now here - hope the same is true for you. My, you've been busy, Valerie! Congratulation on having one of your photos in print - and on a book cover yet! I love how the blue mixed media piece is looking. I hope you'll share when it's completed. I love your pastel portrait of Van Gogh's Mutter that you're sharing again for 2nd on the 2nd. Her eyes are so expressive. Just lovely. Great art work, love the colours on the Egyptian work. ooohh wow,was für grandiose werke und bilder von dir,bin ganz beindruckt,das gemälde von van gohs mutter ist dir spitze gelungen. das deine bilder in dem buch sind ist ja klasse. wünsch dir einen schönen juni. Please take care of yourself!! The extreme heat is bad!!! Keep cool as best as you can and don't over do anything! Loving all your art pieces this week! You have been busy! The African one is so beautiful! Love the Dream one too! Really love them all! Congrats on the book cover!! What an honour!! Enjoy the book! Hope you've had an exceptionally good weekend and the weather has settled down. Beautiful art work, and photos. We're having the same weather here, it's all gone mad. WOW What a gorgeous sky and I love how you added your lady image- beautiful!! Your old woman is fab-well done!